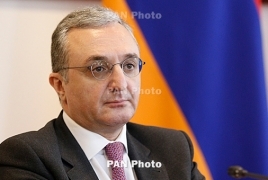 PanARMENIAN.Net - Speaking about peace does not cast doubt on the Armenian side's determination, Foreign Minister Zohrab Mnatsakanyan told reporters on Monday, February 4. His comments came in response to Azerbaijani Foreign Ministry's assessment of a statement by Armenian Prime Minister Nikol Pashinyan who said Armenia will not discuss the land-for-peace formula when it comes to negotiations surrounding the Nagorno Karabakh conflict settlement. Armenia is the guarantor of Karabakh’s security, Mnatsakanyan said. Deputy Foreign Minister of Russia Grigory Karasin earlier spoke about the upcoming meetings of the leaders of Armenia and Azerbaijan Nikol Pashinyan and Ilham Aliyev, as well as those of the Foreign Ministers of the two countries Zohrab Mnatsakanyan and Elmar Mammadyarov.